“The problem seems even greater than we expected it to be,” Hogan told reporters. Hogan promised to plunge ahead with his long promised plans to cut spending and taxes raised during the O’Malley years. 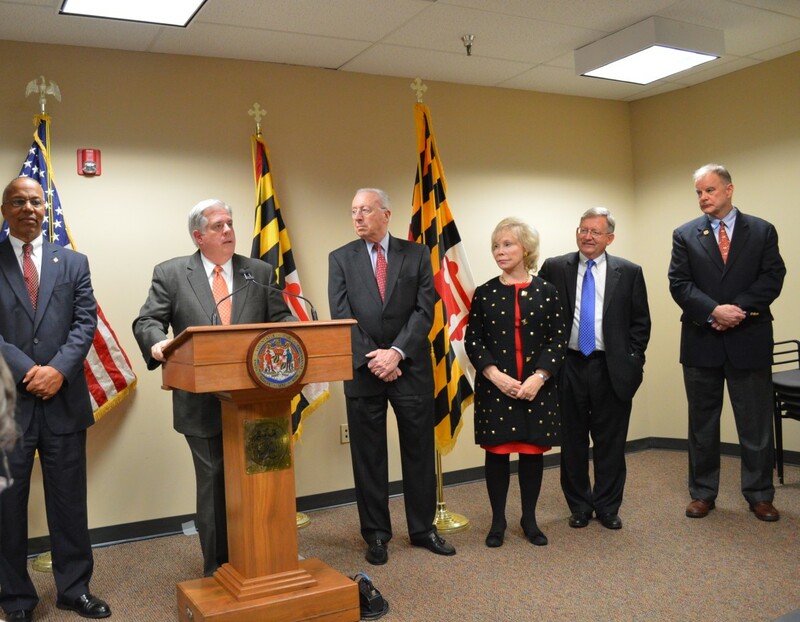 “We’re going to try to roll back taxes as quick as we can,” Hogan said. Five times over the course of a 10-minute news conference he mentioned bipartisanship, with Democrats and Republicans working together to solve problems. “I’m looking for the smartest most capable people” to serve in the new administration “whether they’re Democrats or Republican,” Hogan said. He had already appointed Bobby Neall, a former Republican senator turned Democrat, to be his chief fiscal adviser in the transition. James Brady, Hogan’s transition co-chair, had performed a similar function for incoming Democratic Gov. Parris Glendening in 1994 and then served as Glendening’s economic development secretary. Brady chaired Hogan’s campaign committee. Hogan was just back from Colorado where he attended a “pretty intense” weekend training session for new governors sponsored by the National Governors Association, that included past and current governors. Blair Lee IV: One of the most unusual appointments to the transition team was Blair Lee IV, a longtime columnist for the Gazette newspapers in Montgomery County and regular commentator on WBAL radio. “Blair is the only one of this group that has actually lived in the governor’s mansion,” Hogan noted. Lee is the son of former Lt. Gov. Blair Lee III, who served as acting governor from 1977 to 1979 during Gov. Marvin Mandel’s trial and incarceration. Blair Lee III was the first of the four lieutenant governors since the office was recreated to run unsuccessfully for governor. Lee has been a longtime critic of Gov. Martin O’Malley and is chairman of Lee Development Group, a commercial real estate firm in Silver Spring. Marty Madden is a former state senator from Howard County who was Senate Republican leader. He then served as part of Gov. Bob Ehrlich’s transition team and then as chair of the Critical Area Commission for the Chesapeake and Atlantic Coastal Bays. He is a Nationwide Insurance broker. Sen. Joe Getty, an attorney, was just reelected to a second term from Carroll County. A lawyer, Getty served two terms in the House of Delegates before becoming legislative and policy director for Gov. Bob Ehrlich. He’s “very well respected by people on both sides of the aisle,” said Hogan, and a good friend he got to know in the Ehrlich years when Hogan served as appointments secretary. Anirban Basu is one of the best known economists in Maryland and a regular speaker to business groups. His Sage Policy Group has been a paid consultant to the state. “I can’t think of anybody smarter to get us advice about how we can put Maryland on a better foot and turn our economy around,” Hogan said. Last year, Basu was the keynote speaker for a major event for Change Maryland, Hogan’s group that turned into a campaign organization. At that time, Basu said he favored totally eliminating the corporate income tax as a way to show that Maryland is really open for business. In other venues, Basu has also urged that Maryland try to attract manufacturing to Maryland’s rural counties that are struggling economically. Nancy Grasmick served as state schools superintendent for 20 years under four governors until her retirement in 2011. Now on the faculty at Towson University, Grasmick engineered major changes in Maryland schools including mandatory standardized testing and the introduction of Common Core curriculum standards, though she has been critical of their implementation. In his first term, O’Malley sought ways to remove her because of her attempt under the Ehrlich administration to have the state take over some of Baltimore City’s schools while O’Malley was mayor and running against Ehrlich. But Grasmick proved to be too popular among legislators. “I appreciate having her advice,” Hogan said. Alex Williams recently retired as federal district court judge, and will serve as Hogan’s liaison to the judiciary. Williams had been elected as the first African American state’s attorney in Prince George’s County, where Hogan grew up and worked. “He’s been a good friend of mine for many years,” said Hogan. It’s no secret that Sen. Allan Kittleman will need lots of Democrats to vote for a Republican for Howard County executive for him to accomplish what the GOP did 23 years ago — take over the county government. “If Allan Kittleman can’t have a chance in Howard County, no one has a chance,” said attorney Michael Davis, who was campaign chairman for Republican Chuck Ecker when Ecker defeated Democrat Liz Bobo during her re-election bid for executive in 1990.